Floods in the Stafford Orchard. 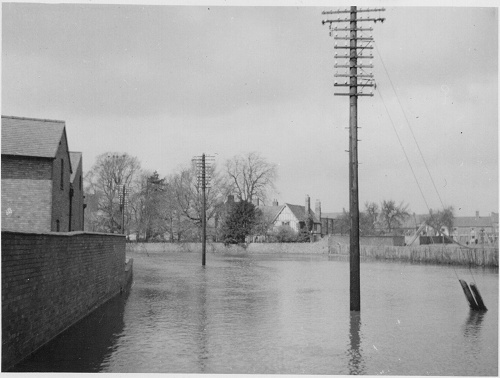 This photograph has been taken from where the existing bridge is on School Lane. Willow trees now dominate this view. The Dower House can be seen in the distance. Wright's mill complex is on the left. To the right is a picket fence. This was actually the boundary between two separate pieces of land. This boundary survives to this day as the path across the park. Even now, the land to the left and right of the path are owned by diferent groups, although they both appear to comprise the park. Believed to be pre-1944.